Hill or mountain: Includes undifferentiated hills and mountains of all slopes and sizes. Includes moraines and kames. Talus slope: Accumulation of mass-wasted boulders forming an apron below bedrock exposures. Bluff or cliff: Very steep slopes usually associated with bedrock areas or eroded lake and river margins. Basin: Refers primarily to colluvial basins (Kreig and Reger 1985 or Kreig and Reger 1982? ), between hills usually filled with wetlands and broad watertracks. Drained or filled lakes: Includes drained glacial kettle lakes in outwash deposits, drained glacial moraine-damned lakes such as the ancient Lake Galbraith, and filled lakes and pond margins. 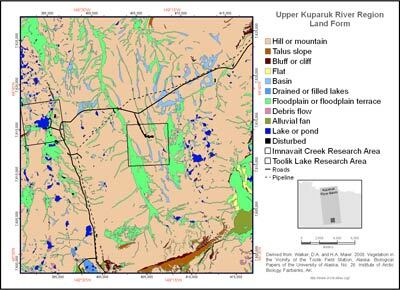 Floodplain or floodplain terrace: Includes active and nonactive floodplains and glaciofluvial outwash, ancient floodplains, also wide drainages filled with watertracks, abandoned sloughs, point bars, oxbows, etc. Debris flow: Includes areas of melting ground ice with debris flows. Alluvial fan: Includes nearly flat alluvial fans associated with existing and ancient lakes and steep alluvial fans at the base of steep valleys that are products of debris flows. Disturbed area: Includes gravel mines and gravel construction pads.